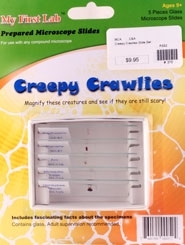 Magnify these creatures and see if they are still scary! Includes 5 prepared slides: Earthworm, Planaria, Ant, Mosquito legs, Honeybee mouth. Includes cardboard storage box.